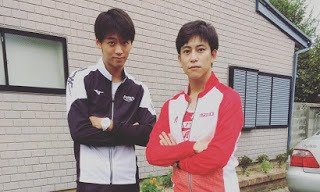 Here's our first look at Ryoma Takeuchi and Gaku Sano's race from the first episode of the sports themed TV drama, Rikuoh! Everybody place your bets! 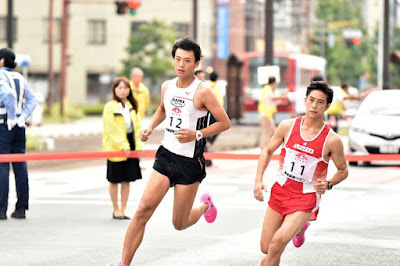 In the first episode, we will meet a young man who is a star athlete for the Daiwa Food Company named Hiroto Mogi (Ryoma Takeuchi), who failed at a basketball tournament and decided a better future as a runner. Then we have his rival, Asian Industry's star athlete, Kezuka Naoyuki (Gaku Sano). Both of them are sponsored by big time shoe company Atlantis. The series also co-stars Masato Wada (our beloved unofficial super sentai geek, Akiba Red) and Ryosuke Yamamoto (Kamen Rider Specter).